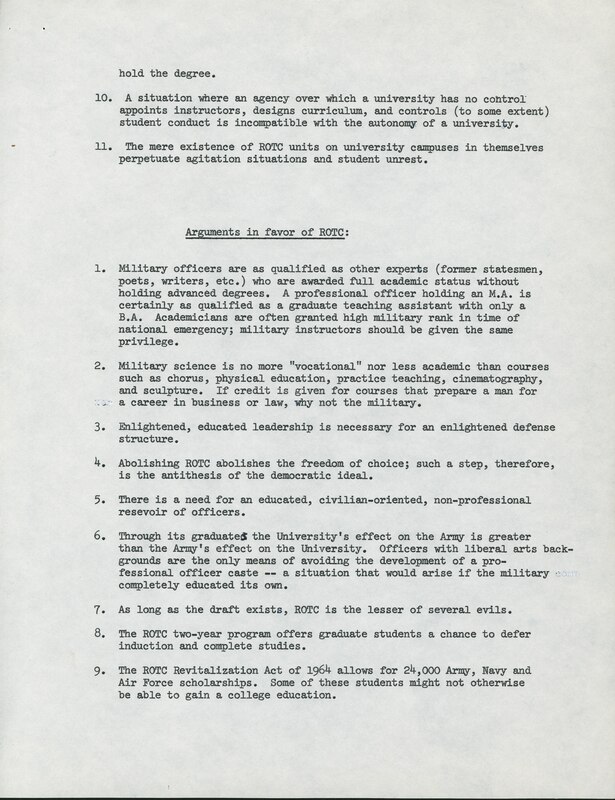 The documents for this project will be digitized in grayscale at 300 dpi in order to save space and avoid unnecessarily large files, with the exception of documents that contain images, such as the protest fliers and ROTC handbooks, which will be digitized at 600 dpi. All documents will be saved at TIFF files, as well as JPEGs. The TIFF files will be retained so that high quality reproductions of the documents can be made, while the JPEGs will allow for easy access to the documents on the site because they upload quickly. After digitizing and using OCR on a variety of the documents with different fonts, colors, and paper types, about 60% of the documents will be able to be digitized with little to no correction required and OCR can be done on the digitized versions with very high accuracy. Of the remaining documents about 15% will require a photocopy of the document to be taken to increase the contrast and then OCR can be done from the photocopy with accuracy. 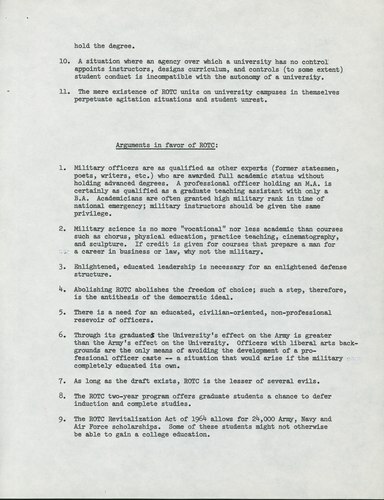 These documents are primarily copies of original documents that were created for distribution around campus or carbon copies. The remaining 25% of the documents contain images, have handwriting on the document, or are otherwise ill-suited for OCR and will need to be transcribed. Due to the small percentage of documents that will require transcription, this will be done in-house by the student workers and checked for accuracy by the project manager. 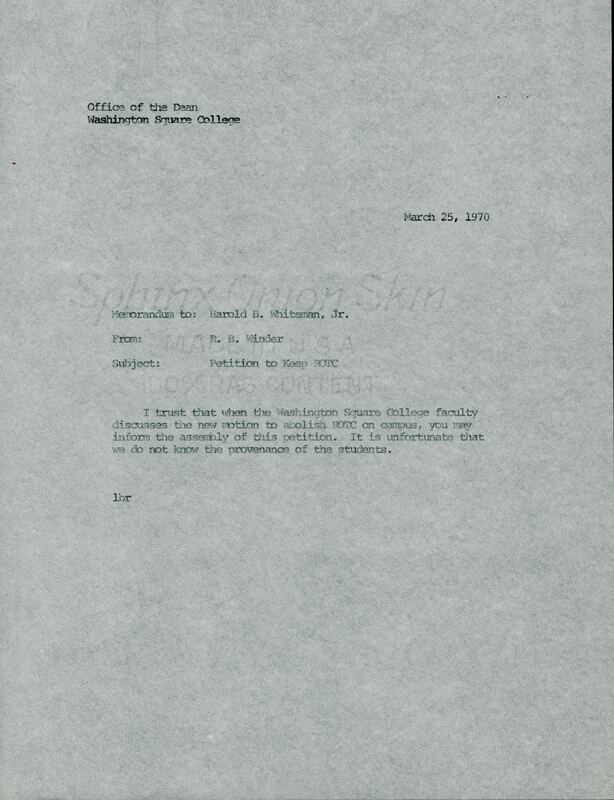 As all the documents are from the NYU Archives, the digitization of the items will take place on standard flatbed scanners within the archives. Any alterations or minor adjustments to the digitized documents will be done in Photoshop and the goal of these adjustments will be to make the digitized documents easier to read while retaining the original appearance of the document as much as possible. This should amount to only minor changes in the contrast, sharpness, and/or brightness of the document. This is a digitization of a document printed on transparent paper with minor shading adjustments. 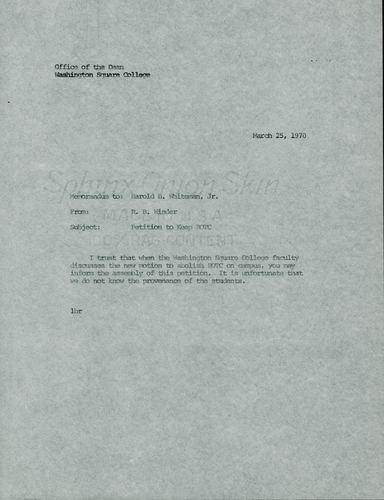 This is the digitization of a typed document on standard paper, representative of most of the collection. will you have any kind of quality control system during your digitization process? will users be able to print or download any of these images, and if so, will you provide PDFs? will transcriptions appear next to images of the documents or will they be hidden behind them? nice document images + good work.